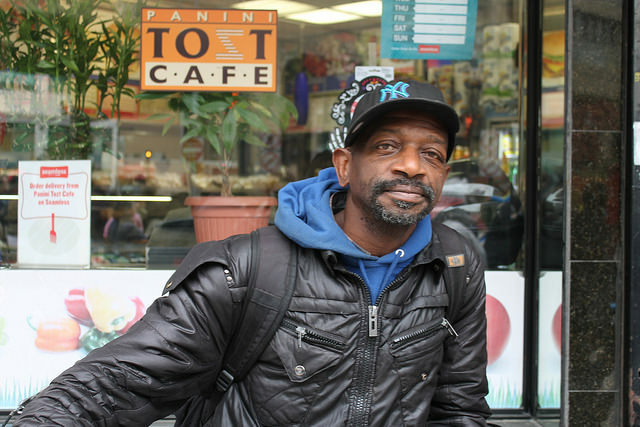 Eugene Chisolm, 59, waited at the corner of Crescent Street and Queens Plaza South in Long Island City, Queens, for the participants in the NYC Marathon to come through. Photo by Karis Rogerson. Before the well-known, talked about and bet upon runners pass the corner of Crescent Street and Queens Plaza South in Long Island City, Queens, the crowd sees a different group of marathoners: the wheelchair racers. Around 9:30 this morning, the street began to fill with music and cheers from approximately 100 gathered spectators whose goal was to encourage the competitors of the 2015 New York City Marathon. The crowd was a diverse group consisting of a wide variety of people from different backgrounds— everyone from the Long Island City native who has watched the race from this spot for the past 10 years to the out-of-towner who took a break from her own morning run to watch to Eugene Chisolm, a construction worker from Long Island City. Chisolm, 59, like his father before him, lends his hands to building upon the city he lives in. Although he has watched the race on TV in the past, Chisolm said it’s better to be there in person to cheer on the racers. “At the end of the day, I get to drink the water and Gatorade they leave behind,” he added with a laugh. Chisolm especially likes to watch the wheelchair racers. He believes many of them are veterans like himself. Every time the crowd’s cheers grew louder, signifying the arrival of another wheelchair athlete, the ex-Marine smiled. “This is what we’re fighting for,” he said. People gathered at the corner of Crescent Street and Queens Plaza South in Long Island City, Queens, cheer as one of the wheelchair racers passes through. Photo by Karis Rogerson. For Chisolm, the marathon is more than just a race. It has significance, he said, for the heart. He joked that he, at his age, he would be unable to run 26.2 miles, but that he admires those who are. “It’s a blessing, “just to make it, ” he said. Even more, though, he thinks the NYC Marathon is what America stands for. The participation of wheelchair racers, he said, proves that in this country, everyone has a chance.